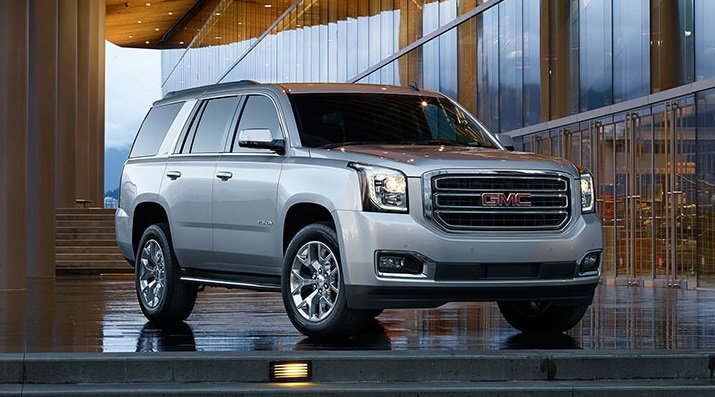 The GMC Yukon is a member of an incredibly shrinking segment of the automotive landscape -- the full-size truck-based SUV. But it's a big segment from GM, which is why the Yukon is new for 2015. Sharing updates given to the GMC Sierra for 2014, the new Yukon is more luxurious and more efficient than ever before, while still retaining capabilities a crossover SUV can't handle. For 2015, the Yukon gets a new look and a new platform. Engines are revised from the previous generation, with a 5.3-liter V8 engine producing 355 horsepower, or a 6.2-liter with 420 horsepower on the top-rung Denali version. A six-speed automatic transmission carries over from the last model, and the most fuel-efficient version is now rated at 16/23 mpg. Rear-wheel drive is standard, while a full-time four-wheel drive system is optional. Most versions seat eight passengers, and the third-row seat now folds flat with the cargo floor, despite still lacking the rear independent suspension of chief rival Ford Expedition. The base SLE starts at $46,335. Standard features include 18-inch alloy wheels, a backup camera, front and rear parking sensors, a Bose audio system, a 110-volt outlet and an 8-inch touchscreen with GMC's IntelliLink multimedia interface. Four-wheel drive adds $3,000. Twenty-inch wheels are optional, as is a heavy duty trailering package, polished exhaust tips and 22-inch wheels. The Driver Alert Package adds forward collision and lane departure warning, and the safety seat alert system. The Convenience Package adds an auto-dimming rearview mirror, power adjustable pedals and a power tailgate. A 40-20-40 split front bench seat is a $250 credit and raises capacity to nine. SLT starts at $55,730 and adds features such as leather upholstery, cooled front seats and heated first and second rows, power fold-and-tumble second- and third-row seats, a power tailgate, keyless entry and start, a heated steering wheel with power adjustments, blind spot warning, cross-traffic alert, forward collision alert and a seat-mounted warning system. Four-wheel drive adds $3,000. Other options include 20-inch wheels, trailer towing package, 22-inch wheels, a sunroof, second-row bucket seats, adaptive cruise control, navigation system and a BluRay rear entertainment system. The range-topping Denali rivals its corporate cousin, the Cadillac Escalade, and kicks off at $63,675. The 6.2-liter V8 is the only engine. Twenty-inch wheels are standard, as is navigation, a 10-speaker Bose audio system, active noise cancellation, a sunroof, second-row bucket seats and magnetic ride control. Denali models also add a unique front-end treatment and interior trim compared to the SLT. Twenty-two inch wheels are optional, as are power retractable running boards, adaptive cruise control and a second-row bench seat. The Touring package adds the sunroof, chrome wheels, head-up display and a BluRay rear entertainment system. No Yukon is cheap these days. SLT gets you into features that make it feel close to a $55,000 SUV. Those considering the Escalade should definitely consider the Denali model, as it's considerably cheaper and similarly luxurious to that model.